Admission to the Diploma Engineering programme is at present through Diploma Entrance Test (DET) conducted by Directorate of Technical Education and Training (DTE&T), Government of Odisa every year. Candidates who have passed/ appeared the 10th Class Examination conducted by Board of Secondary Education, Orissa or its equivalent Examination are eligible to appear the DET. However at the counselling candidates who have passed the qualify Examination are only eligible for admission. Candidates who have passed the 2 years trade of ITI after passing 10th Class Examination or Candidates who have passed +2 Vocational (not +2 Science, Arts or Commerce) are eligible. Such candidates must have obtained not less then 60% marks in the concerned qualifying Examination and must be permanent resident of odisa. N.B. 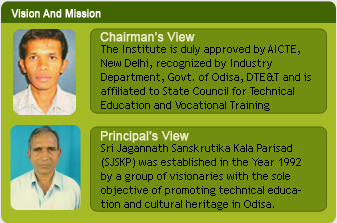 : Candidates have to qualify the DET conducted by DTE&T, Orissa for admission in to Diploma Courses. The lower age limit is 14years and the upper age limit is 25years for Admission to all Diploma Courses. 3years relaxation in the upper age limit is allowed for SC/ST candidates.